“Here comes the summer” trilled The Undertones back in 1980. “It does? Hmmm, then here also comes a large buzzing battalion of wasps attracted solely, it seems, to my face” one could conceivably reply. What I’m saying is that for every upside, there will likely be a downside. The upside of once more being close enough to be able to follow m’team with obsessive fervour is that it leaves little time for the freedom of fairly random neutralling; the casual, serendipitous nature of the hobo lifestyle. If I had two wishes (it has to be two as I would almost certainly waste the first on requesting a Mars ice cream or something) it would be that I could split myself in half and be able to do both each weekend. Actually, if this is total fantasy, I’d have a third me draped over my sofa watching Soccer Saturday whilst working my way at a feisty canter through a double pack of party ring biscuits. All bases covered. Still, that’s what makes May such an ideal time. The Hawk season is over but the lower rungs, on pitches more susceptible to winter postponement, are still playing catch-up. Thus I can indulge in a little extra-curricular without distraction and whilst the sun shows its balmy hand. Well, in theory anyway. More accurately here I was stood next to a roped-off pitch in west London whilst a shower unexpectedly threw down its challenges, where the only cover was the two jerry-built chipboard dugouts, and where the wind was blowing so hard I had to stand behind the goal at the far end just to stop my hair resembling a billowing Medusa fright-wig. The gently idyllic picture I try to paint of this type of endeavour was arm-wrestling with grim reality’s salt-and-pepper landscape and pugilistic air stream, and was finding its whitened knuckles embedded in the table beneath. Still, despite the conditions being as unattractive as an alleyway knee-trembler with Charles Clarke, the sprawling Osterley Sports Club was a hive of activity. Two cricket matches were occurring side-by-side and, as they always do, were making me lament my decision to quit club cricket at the age of 16; relative fitness and the occasional four-for given up just so I could get a Saturday job for pin-money I’d ultimately squander. Sigh. On the other side of the clubhouse, Cranford Archery Club were beginning their Saturday shoot. They too were affected by the conditions. After setting up their gear they shot their opening salvo and then spent about quarter of an hour on their hands and knees in the long grass behind the bulls-eye trying to locate their delinquent arras. Watching them pad about like kittens trying to see what’s under the fridge, I realised that the risk of my inadvertently re-enacting the reign of King Harold II, specifically the very end of it, had never been so high. Elsewhere two very low-key football matches were in various stages of their unfurling*, whilst two were about to start. 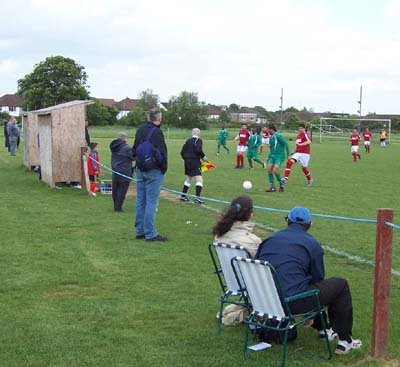 One of these games was inside CB Hounslow United’s fully-enclosed Combined Counties League standard ground, as their reserve team squared off against Worcester Park stiffs. None of the 88 players on show around the grounds, I noted, seemed in the least bit perturbed by the Cranford club’s waywardness, nor the thought of a looming harpooning, and thus their game focus should be duly heralded. Despite a ground with cover, from rain or any other potential projectiles, being just yards away, the match I had come for was the one about to take place on the parallel pitch just outside the fencing, and inside the rope. Considering I have made an effort to visit my new ‘local’ teams in senior football since moving to London (Leyton, Leyton Orient and Sporting Bengal United), it seemed about time I had a look at the team that represents the town I actually live in. Formed just nine years ago to promote football to young people in Tower Hamlets (briefly changing name to London Abohani in 2005), Bethnal Green moved last year from the austere park pitch at Meath Gardens to share Mile End Stadium’s grass with Sporting Bengal. This was partly due to their ambition to eventually enter the senior echelons and then be able to participate in the FA Cup and Vase. 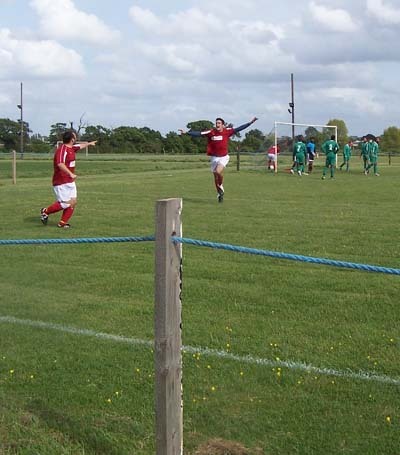 However, last summer their application to join the Essex Senior League was turned down on appeal. Perhaps following this more successful season for them, they may now be able to present a more convincing case for an uplift. With Hayes United a point behind and also needing to complete one more game, Bethnal Green’s task for this game was straightforward: win and be MCL Premier Division champions. They couldn’t have asked for more agreeable opposition either, FC Deportivo Galicia having only a single win to their name, and a goal deficit of -59 over their 21 fixtures prior to this. Deportivo were formed in 1968 (as Centro Galles de Londres) by immigrants from Galicia in north-west Spain and joined the Middlesex County League in 1995 after previously playing in a variety of Sunday leagues. They finished bottom of the MCL Premier Division last year and, being fifteen points behind second-from-bottom Willesden Constantine, were guaranteed the same fate regardless of their result in this game. Given these circumstances and with the gale behind them, the regularity with which Bethnal Green lay siege on Deportivo’s goal in the first half was unsurprising. However they struggled to deal with the force of it themselves at the start of the half, with many a ball sailing off into the distance on a regular basis. Even with only one spare available, no-one seemed keen to gather in the strays, so I did the honours on a few occasions, chasing after the speeding spheres like David Pleat in an 80’s beige suit retreating from the sound of spud-gun-fire. Once Bethnal worked the conditions out, they began puttin’ on the championship style, scoring some fine goals, albeit some assisted by a flat-footed Galician defence. Daniel Sabaroche was particularly good, scoring twice: one a deft lob, one a well-timed flick past the oncoming keeper. At half-time it was 4-0, the second being the best of the bunch, a wicked shot from the edge of the box that caught the draft and whistled into the top corner. Galicia scored their two goals in the second half, one right after the re-start and another after 63 minutes, playing the wind as their much needed 12th man. Their second goal came direct from a corner [see third picture], the scorer then picking up and kissing his son, who had run on the field to celebrate, and telling him “I told you I’d score one like that.” Clearly he’d watched the Countryfile forecast the previous week as Mother Nature had already handed in her claim for a hefty assist bonus. In truth, Bethnal Green deserved their title if only for being able to score two more goals despite facing up against the wind tunnel blast. Although I imagine they were referencing their entire season when they started running around and spraying each other with bottles of supermarket champagne on the final whistle. 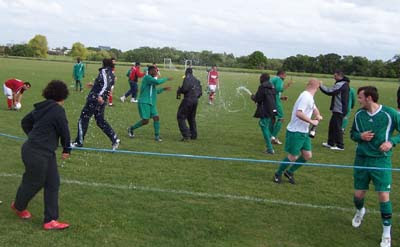 Bethnal Green United: Middlesex County League champions 2008/09. Warms the Cockney cockles of my ol’ East End ‘eart, it do. They dun us praaahd. *one of which, apparently, was Kensington Dragons 5-2 win over Horseed in the Middlesex County League’s Division 3 (Hounslow & District). At the Essex Senior League's AGM, Bethnal Green United were elected into their fold for the coming season which means, as the Essex area doesn't have an appropriate step six division, a jump of two steps up the pyramid for them. Still, as the ESL has only operated with 15/16 clubs for a few years now, there is certainly room for clubs with the right infrastructure looking to progress. All the best from the artist formerly known as malmo58! Bethnal Green isn't very near to Osterley - which highlights one of the problems of being a park player in London. All the usable pitches, Hackney Marshes apart, are in far flung suburbs, only gettable to by car, thus making for a frustrating experience all round. 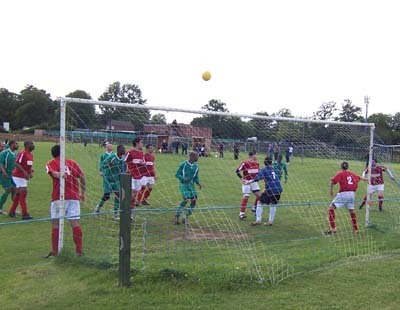 I played one game for a team in Edgware after being met with these difficulties. Thanks for your comment Lanterne. I'd say the Middlesex County League is probably one step up from parks football through being in the Pyramid and all, but that is mostly to do with admin I guess. The football and some of the grounds (Galicia's for a start) are merely a rope barrier in advance of a parks game. Middlesex being the kind of entity it is does mean that Bethnal Green had to trog out to the wild west most of the time. Sod the two divisional promotion they've won, being in the Essex League should cut down on a bit of travelling - it'll certainly save having to swing round the orbital all the time.